At age 71, Bill Strachan puts most of us to shame. A keen sports player all his life, Bill hasn’t let his advancing years or his dodgy knees hold him back, and is the current captain of the Aberdeen and Crathes Croquet Club. The notion of croquet might conjure up images of the eccentric English genteel enjoying a cucumber sandwich or two while mallets gently click balls in the background. But the reality is a world away from that. As Bill explained, he developed a passion for the game at one of the most northerly croquet clubs in the world. “I’ve always been active,” he said. “From the age of about 10 I’ve played various racquet sports, mostly switching between tennis and badminton. “But as I got older my knees started playing up so I just couldn’t continue. “They told me I was too young to get any sort of knee replacement but I didn’t want to give up sports entirely. “So I started cycling and that was that. “Then about five years ago I looked out my front window which overlooks the Albury Sports Centre in Aberdeen and saw that they were measuring up the bowling green for something. 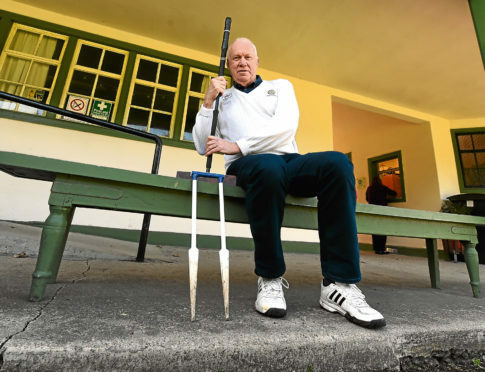 Bill and his wife Meg, 69, are now both volunteers at the croquet club, and although now somewhat of an expert in the sport, Bill still remembers his first day on the court. “The only croquet I’d ever seen was in Alice and Wonderland!” he laughed. In a departure from the whimsical hedgehogs and flamingos which make up Lewis Carroll’s childlike game, in real life croquet is a complex and challenging sport. The game has two distinct versions: association croquet and golf croquet. Association croquet is highly tactical, involving building breaks and scoring many hoops in a single turn, while golf croquet is a simpler, yet still challenging, faster-paced game. A full-length match can see players on the court for anything up to three hours, and Bill was amazed at how active the sport is. Various NHS reports show that activity levels across all age groups are lower than recommended, with more than half of over 75s achieving less than 30 minutes of activity a week. The Department of Health has labelled inactivity a “silent killer” and evidence is constantly emerging that sedentary behaviour is bad for our health. However, getting active needn’t feel like a chore. “There is a huge social side to croquet which I never expected,” said Bill. “Particularly golf croquet which is great fun with a group. “We also organise social evenings and quiz nights, so there is actually a lot more to croquet than just the croquet. “The main season runs from April to October and we often hold club singles and doubles tournaments throughout the summer. “I’ve always been competitive so I like to take part in more serious competitions too. Bill himself has proven to have an aptitude for the game, having won the famous Spalding Trophy two years in a row as part of a doubles tournament in memory of Bill Spalding, former president of Scottish Croquet and the Glasgow Croquet Club. However, that might just be down to the hours of practice he has put in – after all, he does live just across the road from his local court. “We do have official session times a few days a week, but if it’s a sunny day and I fancy a game I can just pop round to the centre and hit some balls,” said Bill. “Friends often call me up and ask if I fancy a game and we just make our way over. “The official season is over the summer but there is nothing to stop us playing all winter, except maybe the weather,” he laughed. The club is holding free have-a-go days in the next two weeks, when anyone interested in trying the sport can do so at Albury Sports Centre on Sunday, April 29 or Crathes Castle on Sunday, May 6. All equipment is provided and the only thing needed to try it is a pair of flat shoes. Oh and perhaps waterproofs – this is one of the most northerly registered croquet clubs in the world, after all.